However, they will give a tough answer to enemy shooting. 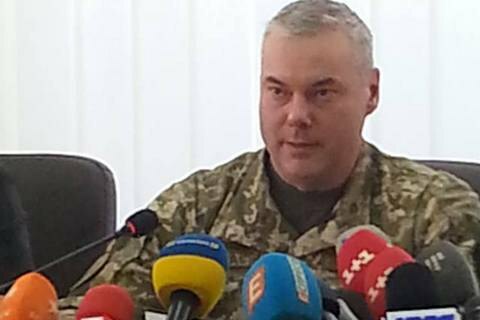 The Joint Forces command does not expect an escalation in hostilities in Donbas due to the launch of the operation and says the Ukrainian Armed Forces will fortify their positions on the line of contact. He was speaking at a briefing in Kramatorsk on the occasion of the launch of the Joint Forces (JF) operation, JF Commander Lt-Gen Serhiy Nayev said. "I know that Donbas residents on both sides of the line of contact are most afraid of active hostilities. We understand this. That is why I want to stress once again, we do not expect an escalation in hostilities due to the start of the operation," he said. "We came not to fan the conflict but to speed up its completion," Nayev added. He promised that notable efforts would be made to strengthen the positions of the Ukrainian Armed Forces on the line of contact. "This means that fortifications will be further equipped and strengthened, new shelters for personnel and equipment will be created," he explained. According to Nayev, there are plans to review mine and explosive fortification schemes and clear explosives, first of all, from the areas which pose danger to local population. Nayev said that the Ukrainian army would give a tough response to enemy shooting. "Above all, we will not agree to the enemy's systemic shooting at Ukrainian positions in violation of all possible agreements and the declared ceasefire… Response to such provocations will be tough and irreversible. We proceed from the fact that the implementation of the Minsk agreements does not deprive us, the Joint Forces, of the right to self-defence, that is to defence from fire and reaction to terrorists' actions by all possible means," he said. Nayev said that this year antitank units on the line of contact were being equipped with modern antitank systems made in Ukraine, such as Stuhna-P and KORSAR, which will make Ukraine's antitank defence tighter and more reliable. Ukrainian army units will make more active duty use of counter-battery radars to track enemy artillery fire. Nayev said that the Joint Forces had not taken on US Javelin systems yet. The antiterrorist operation ended on 30 April and the Joint Forces Operation began.